Deeside Dragons notched up their 7th win in a row and continued an incredible run that has seen them go unbeaten in their last 18 games with a 7-5 home win over previous league leaders Nottingham Lions. The game was a lot closer than the recent 2-8 and 1-7 wins that the Dragons had picked up in Nottingham and the Lions actually raced into a 0-2 lead early in the first period before being pegged back. Import Adrian Palak top scored for the Dragons with 3+2 and Simon Furnival got 3+0. The Dragons need just 5 points from their remaining 5 games to win the Laidler title and, if they win away at second place Widnes on 14th February, the championship will be in the bag. Widnes are doing the best to catch up with the leaders, however. They have 3 games in hand and two games still to come with the Dragons. They picked up their 4th win in a row with a hard fought 7-5 win over Blackburn Eagles on Sunday. The Eagles have a very good record this season and look favourites to grab the 4th play-off place. The Eagles actually took an early lead and were not overtaken until midway through the game. Widnes eased into a 5-1 lead by the second break but 4 3rd period goals for the Eagles made it a closer finish than it might otherwise have looked. Fifth place Altrincham Aces are making late run for that last play off place as well and their 5-3 win over Hull Jets move them to within 4 points of the Eagles. Both teams have played the same number of the games and will meet twice more before the end of the season – so anything could still happen! In the other Laidler game of the weekend, Coventry Blaze lifted themselves off the bottom of the table with a 2-5 win away at Bradford Bulldogs, who now occupy bottom slot. The Blaze were 0-5 up before the Bulldogs finally managed to score in the 47th minute. Matthew Maurice and Jack McKay both hit 2+1 for the Blaze. 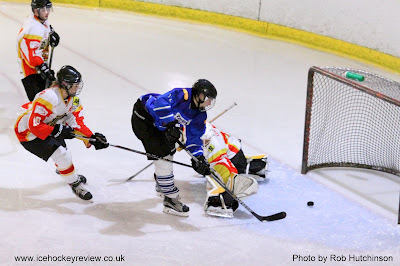 Photo: Goal action from Coventry Blaze ‘s 2-5 win away at Bradford Bulldogs. Photo by Rob Hutchinson Photography.